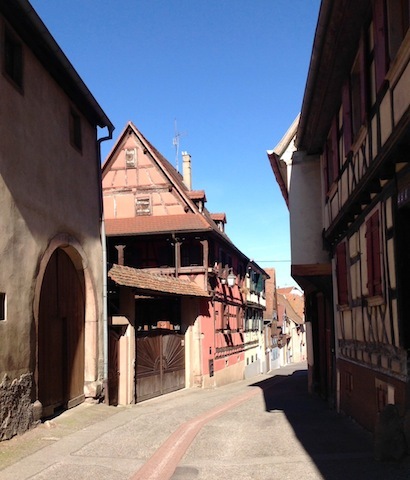 Sélestat is a relatively small town of about 20.000 residents. 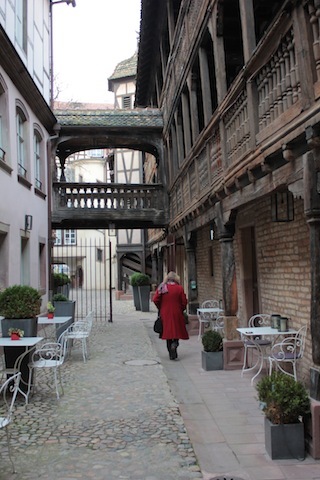 We spent many hours just walking around, and most of the town (so it seems) is an array of historical buildings, half-timbered houses, towers, etc. 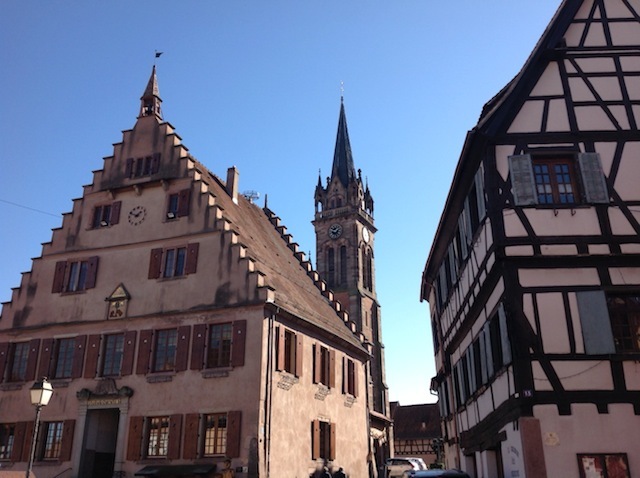 The church tops in the center of town gave us a good sense of orientation. Without them, we would have gotten lost once an hour. At least. 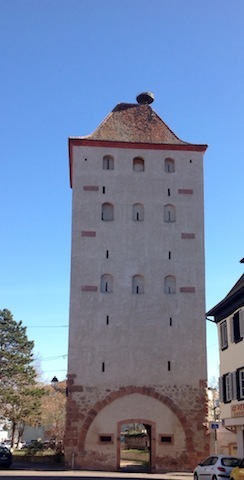 This is the Ritterturm (Knights’ Tower) in 2019. 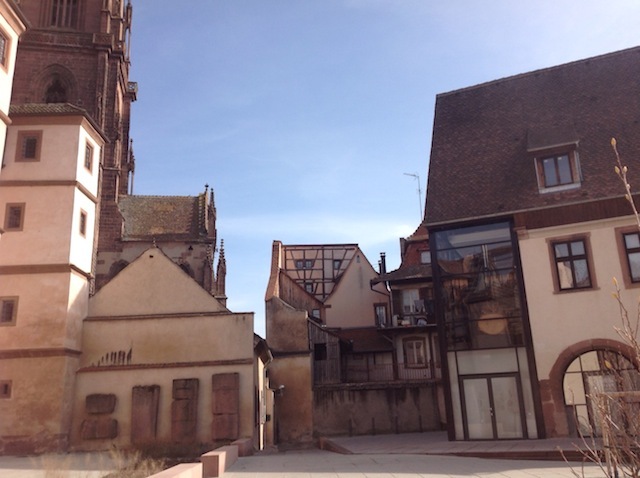 This is an usual view of the St.Georg Church (from left to right), the empty facade of a half-timbered house, a residence with laundry hanging outside, and a very modern glass addition on the Maison du Pain d’Alsace Museum. 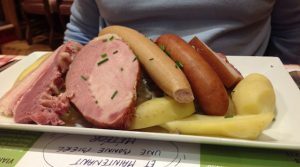 We had dinner at the ‘Brasserie Chez Youpel’ and my husband actually managed to eat all of his Choucroute platter. 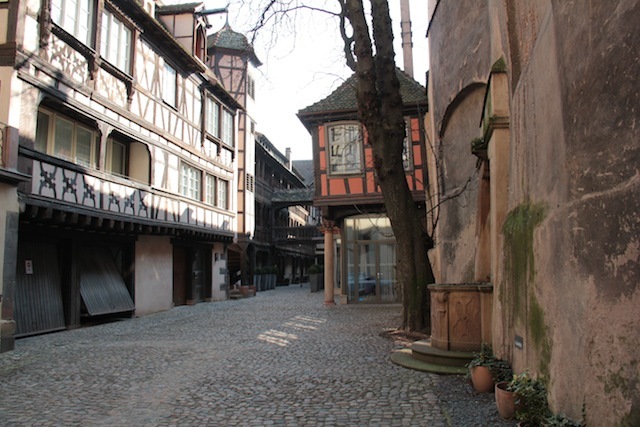 We have stayed at the Hotel Cour du Corbeau in Strasbourg a couple of times. 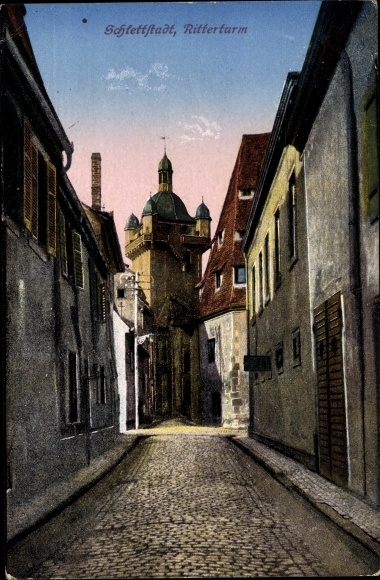 Just a couple of weeks ago, I ran across this historical postcard, showing the building in its former stage. 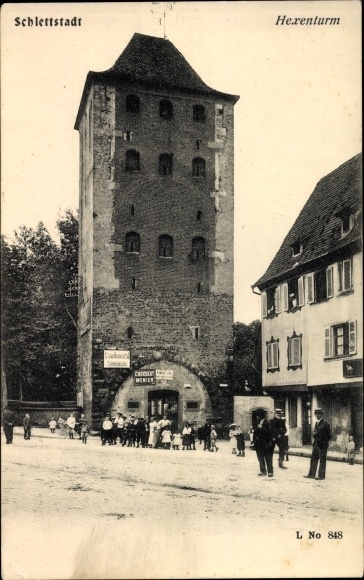 It might be safe to assume this postcard is from around 1930, because this was the year the Cour du Corbeau was listed as a historic monument. 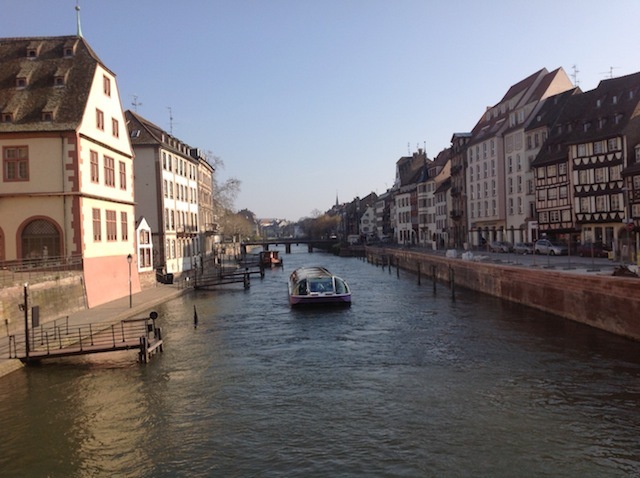 We usually go to Strasbourg once a year, and our highlights remain staying at the 4-star Hotel Cour de Courbeau, and then visiting the flea market on Saturday morning. Again this year, we got there on Friday around 3pm, and left the city on Saturday shortly after lunch. 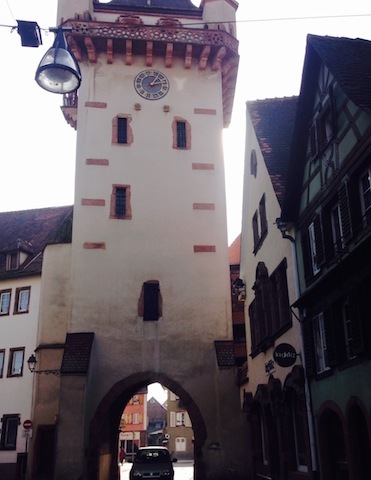 It is enough time to pack in quite a few things, such as a visit to the Alsatian Folklore Museum (about a minute walk from the hotel), visit a few restaurants, shop at the flea market, stop for some coffee and a pain au chocolat, and much more. We usually park at the Austerlitz Car Park, which is a minute from the hotel, has clean facilities, and the rate for one day is just under euro 20. 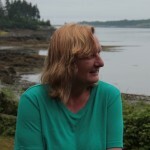 This is always our first stop – the bridge overlooking the River Ill. 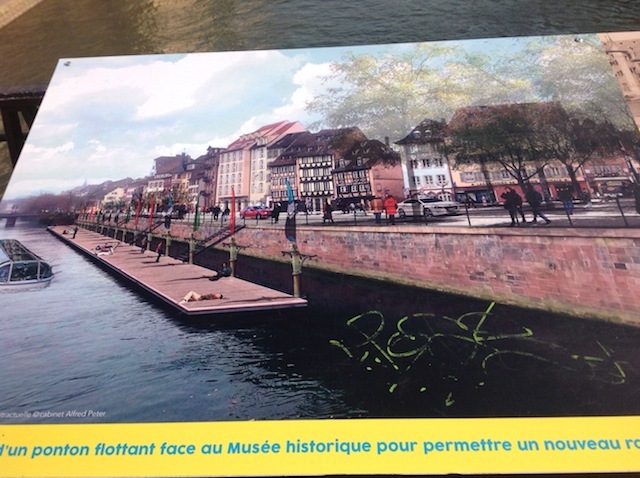 This is an ad for the city’s upcoming plans – to build a floating jetty, across from the Historical Museum. 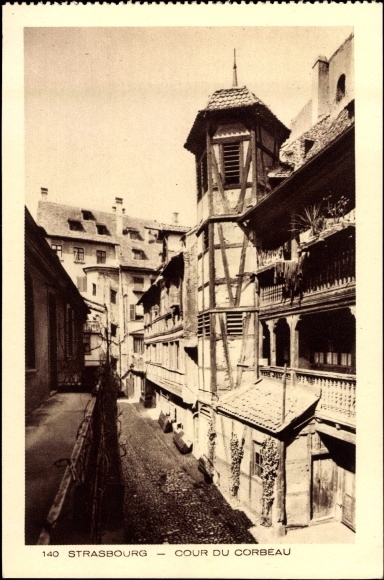 This is the courtyard of the Hotel Cour du Corbeau. 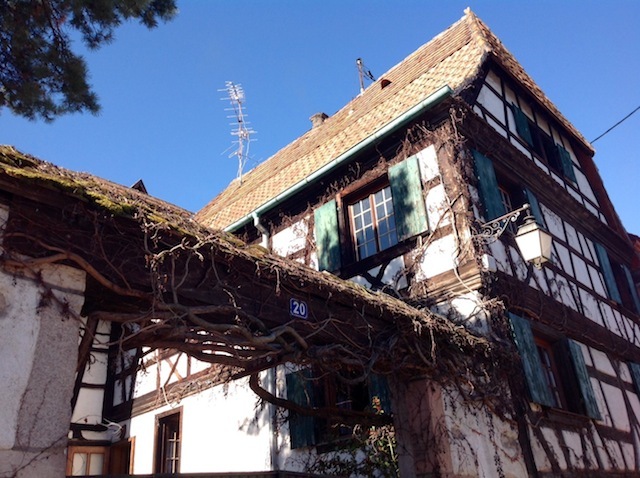 Built in 1580, it has served as an inn (or hotel) for most of its time since then. 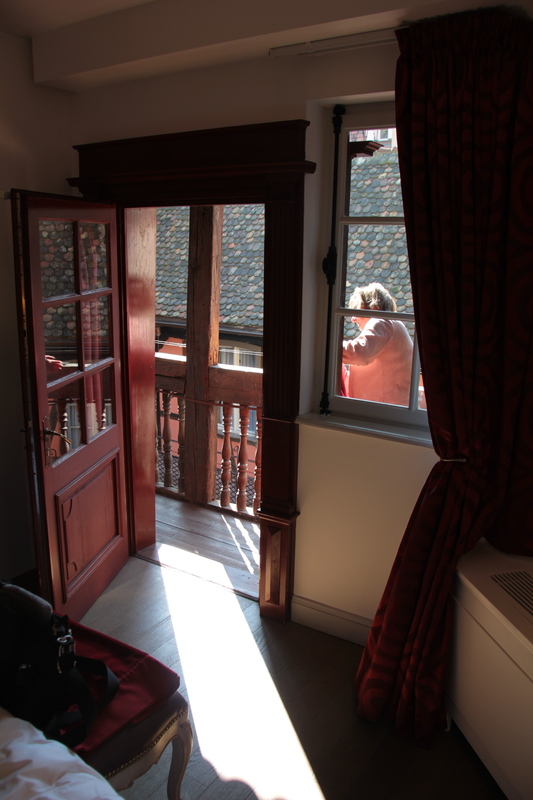 View from our room onto the balcony. Last year, we were able to sit on the balcony late in the evening. This year, a Siberian wind made it impossible. 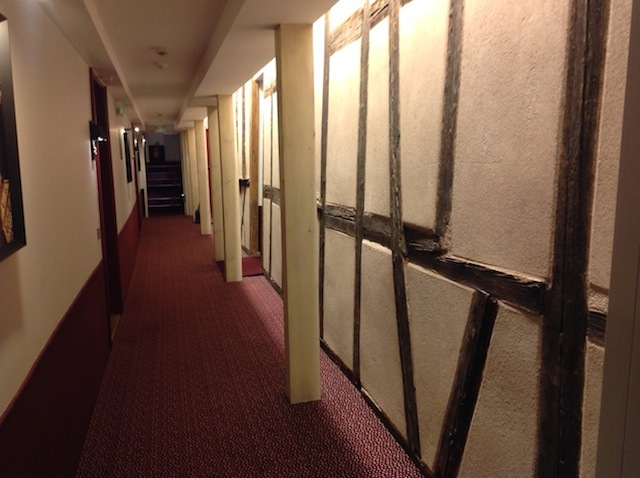 Some of the interior was renovated to reflect its original half-timbered building style. 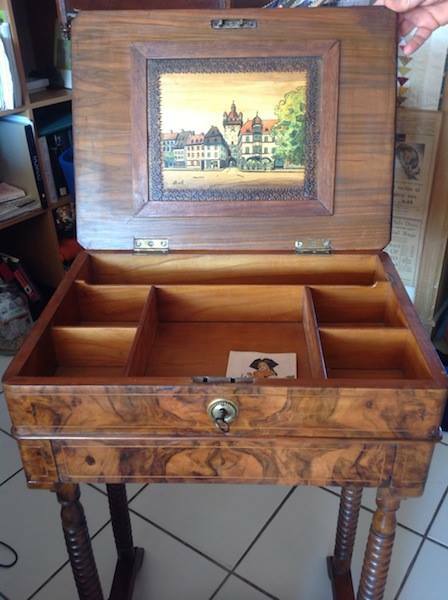 This is what I found at the flea market – a sewing table, with a painting by Louis Bollinger (a.k.a. BOLL or BOLI). We had a grand view from the vineyards. 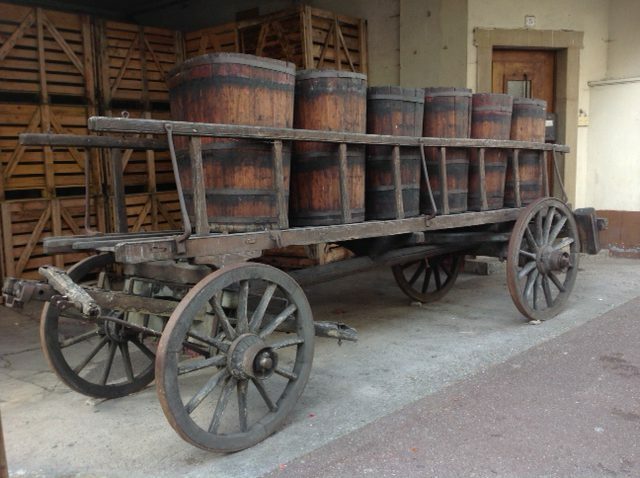 Don’t forget to bring a picnic basket. And a cork screw. 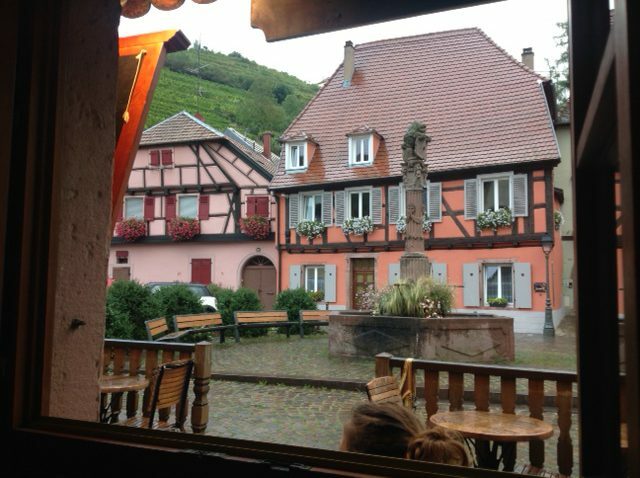 The main road is lined with mostly half-timbered houses. 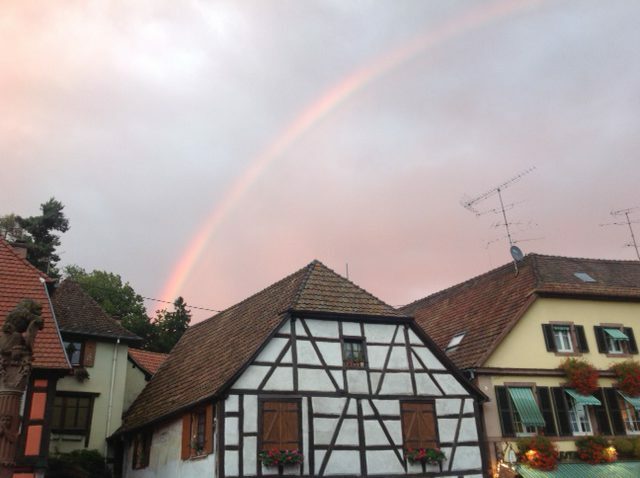 And yes, I still like rainbows. 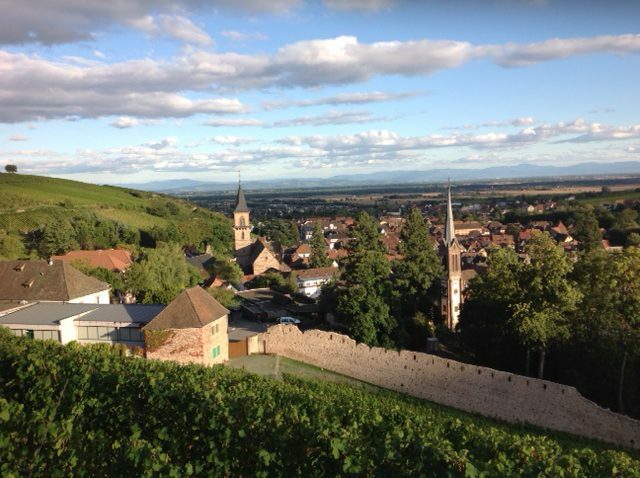 With tourism centered around the wine industry, there are some interesting corners to discover around this small town. 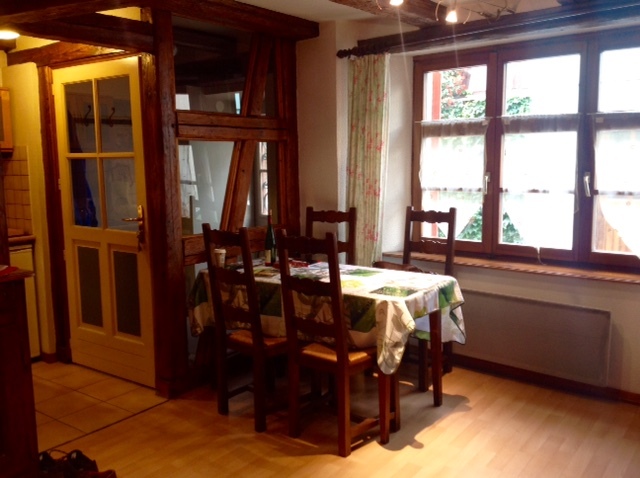 We had rented this one-bedroom apartment via fewo-direkt.de. 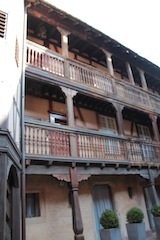 The first floor apartment is in a quiet side street off the main road. It was perfect for the two nights we spent there.